Many installations are designed with requirements for winding more than one layer of wire rope on a drum. Winding multiple layers presents some further problems. The first layer should wind in a smooth, tight helix which, if the drum is grooved, is already established. The grooves allow the operator to work off the face of the drum, and permit the minimum number of dead wraps. A smooth drum presents an additional problem, initially, as the wire rope must be wound in such a manner that the first layer will be smooth and uniform and will provide a firm foundation for the layers of rope that will be wound over it. The first layer of rope on the smooth drum should be wound with tension sufficient to assure a close helix-each wrap being wound as close as possible to the preceding wrap-and most, if not all, of the entire layer being used as dead wraps. The first layer then acts as a helical groove which will guide the successive layers. Unlike wire ropes operating on grooved drums, the first layer should not be unwound from a smooth-faced drum with multiple layers. After the rope has wound completely across the face of the drum (either smooth or grooved), it is forced up to a second layer at the flange. The rope then winds back across the drum in the opposite direction, lying in the valleys between the wraps of the rope on the first layer. Advancing across the drum on the second layer, the rope, following the “grooves” formed by the rope on the first layer, actually winds back one wrap in each revolution of the drum. The rope must then cross two rope “grooves” in order to advance across the rum for each turn. The point at which this occurs is known as the cross-over. Crossover is unavoidable on the second, and all succeeding layers. Figure 33 illustrates the winding of a rope on the second layer from left to right, and from right to left-the direction is shown by the arrows. At these cross-over points, the rope is subjected to severe abrasion and crushing as it is pushed over the two rope “grooves” and rides across the crown of the first rope layer. The scrubbing of the rope, as this is happening, can easily be heard. Severe abrasion can also be reduced by applying the rule for the correct rope lay (right or left lay) to the second layer rather than to the first layer. It is for this reason that the first layer of a smooth drum should be wound tight and used as dead wraps. *Counterbalance grooving is made so that each wrap of rope winds parallel to the drum flange for a distance less than half the circumference around the drum, then follows a short cross-over to complete half the drum circumference. The cross-over is at an angle with the drum flange and displaces the rope laterally by half the pitch of grooving. Around the other half of the drum circumference each wrap again winds parallel to the flange for a distance, and then follows another short cross-over to a point one full circumference from the start. At this point the lateral displacement is equal to the full pitch of grooving. The grooving for this type of winding is similar to the parallel grooving except that half the drum circumference is laterally displaced from the other half by half the pitch of grooving, and between these two halves the grooves make short cross-overs to guide the rope properly. The two cross-over areas are on opposite sides of the drum, or 180º apart. 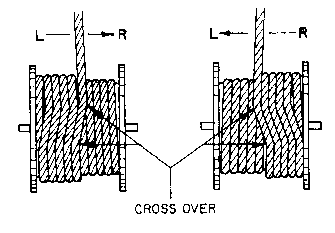 Since the lateral displacement of each cross-over is one half the pitch of grooving, or one half the displacement of the cross-overs encountered with other types of winding, “throw” of the rope is reduced, decreasing the whipping action. However, if the interval between these displacements happens to match the rope’s vibration cycle, whipping can still become severe because this action is cumulative. Since the cross-over areas are spaced opposite each other, or 180º apart, raised portions of the winding caused by vertical displacement at the cross-overs also occur opposite each other. These raised sections become quite pronounced where many layers are involved and the balancing effect of keeping them opposite gave name to the method. With counterbalance winding, the change of layers can be controlled better than with other systems and is preferred when a rope must wind in many layers on the drum. Figure 33. After the first layer is wound on a drum, the point at which the rope winds back for each wrap is called the cross-over.